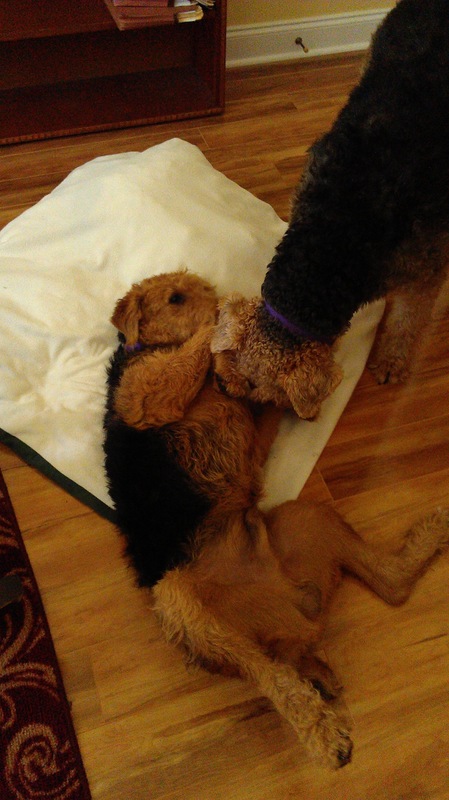 Quinn is a special needs Airedale. Quinn’s ideal adopter is one who has the patience to bring him into his potential. He has limited human interaction in his early life and he is almost feral like in his behavior. Quinn needs positive motivation and nothing forceful in corrections. He needs to be saturated into a home life. If you have experience with this and are interested in Quinn, please let us know. 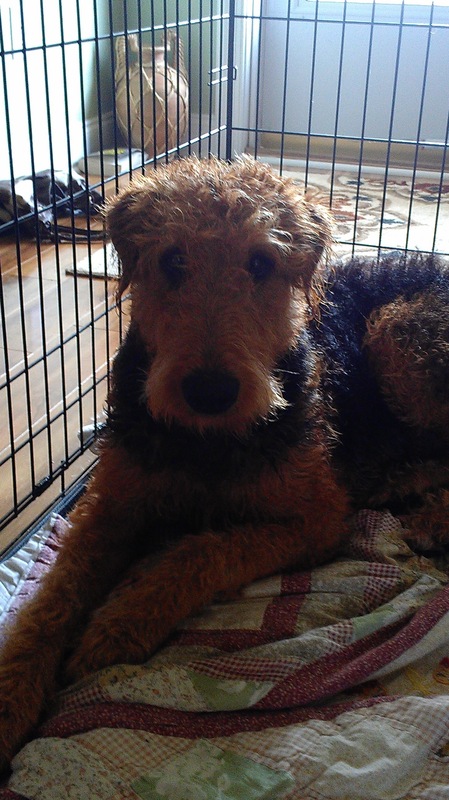 Meet Quinn, a bouncy, playful, 10-month-old Airedale who has grown up without the assistance of human interaction. 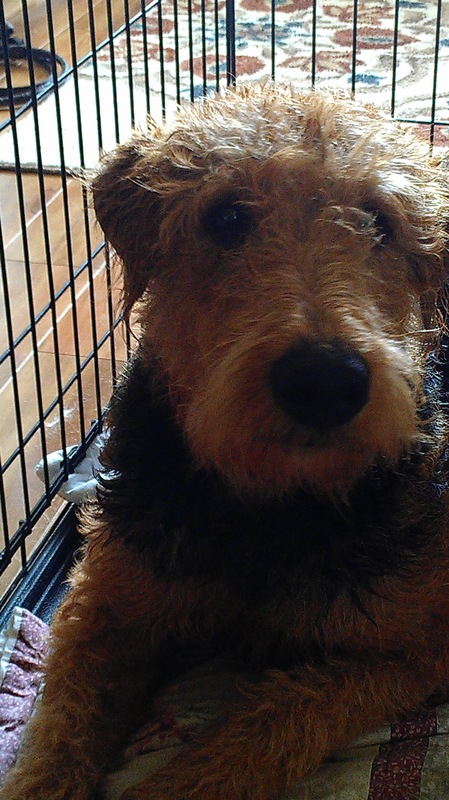 Quinn’s fur is a dark black saddle with this beautiful chestnut-glazed thick and wiry fur. Quinn loves other dogs, has no food aggression, is nearly housebroken, sleeps in a crate, and is a wonderful guard dog to announce strangers at your door. 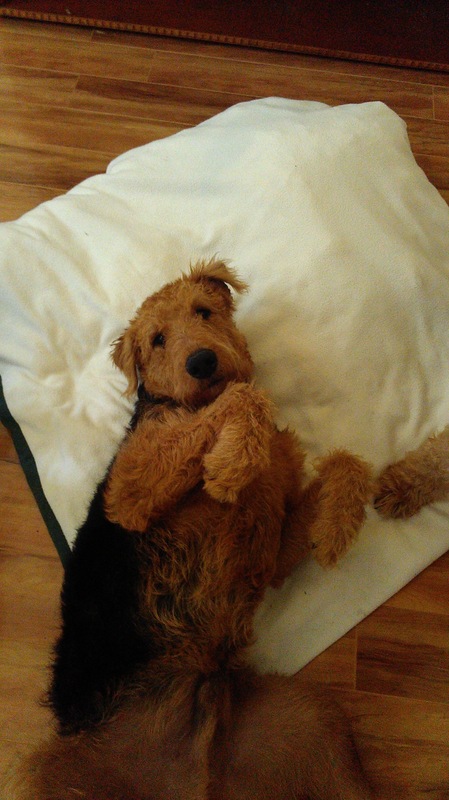 Quinn loves to play, is learning about squeaky toys, and is now asking for “belly rubs” when you approach him. Quinn needs some help being socialized with humans and understanding that a human touch is a good thing. Quinn is one of those dogs that will be wonderful with more human interaction and public / social experience. However, Quinn needs a very special situation to help him grow into the dog he can be. Quinn would do best in a home with little change as Quinn likes things to be the same or it upsets him. He is a routine oriented Dale. Quinn will need daily walks with a secure harness/leash, and probably a few obedience classes. Because of Quinn’s fear due to lack of socialization, Quinn will urinate when interacting with people at times. However, don’t underestimate this little guy with his social awkwardness — he learns very, very quickly, especially when cooked chicken is his reward. You can see his confidence growing daily! Quinn loves riding in the car, withstands the indignity of a bath, and when out in public, his curiosity outshines his timidness. As he meets more and more people and hears the “coo’s and awww’s” about his beauty, Quinn will shine! The mighty Quinn went to his new home yesterday, was graciously welcomed by his new canine siblings. Very good early report.